Billet aluminum handle assembly for both hood and trunk included. Cables are "U-Cut-to-Fit", designed with specially extruded liner for extended cable life, and include aluminum fittings and stainless steel inner wire. Hood-Release Kit includes aluminum firewall fittings and cable stop. Outer housing is 18" inside the vehicle and 6' under the hood. Inner wire is 9' long. 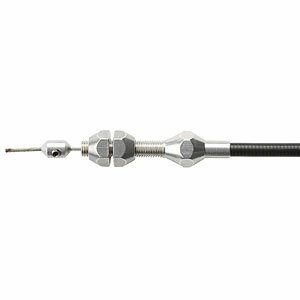 Trunk-Release Kit includes cable stop; outer housing is 15' long, and inner wire is 16' long. Cable-operated latches required. Billet aluminum handle assembly and cables included. Cables are "U-Cut-to-Fit", designed with specially extruded liner for extended cable life, and include billet aluminum fittings, stainless steel inner wire, aluminum firewall fittings, and cable stop. The outer housing is 18" inside the vehicle and 6' under the hood; inner wire is 9' long. Cable-operated latches required. Billet aluminum handle assembly and cables included. Cables are "U-Cut-to-Fit", designed with specially extruded liner for extended cable life, and include billet aluminum fittings, stainless steel inner wire, and cable stop. The outer housing is 15' long, and the inner wire is 16' long. Cable-operated latches required.